It was a short time of coincidences. The guitarist Miles Okazaki shared the following picture on Twitter. It's just before the contents page of the late Yusef Lateef's Repository of Scales and Melodic Patterns, which I admit to never having owned or read [yet]. The week before though, I read a fascinating transcription of a talk that Evan Parker gave on John Coltrane in which he talks about Coltrane's attempts to relate musical and spiritual concepts. Since I actually have to look at Coltrane's thinking for my work on contrafacts, it's all quite timely. This might get technical, but I'll do my best to keep it at a generally readable level. I'm looking at the diagram and asking two questions: how did Coltrane construct the diagram; and why did he construct it? I have no answers as yet, but I'm writing it here so I [and if you're interested you] can refer to it later. The first question is actually harder than it looks. 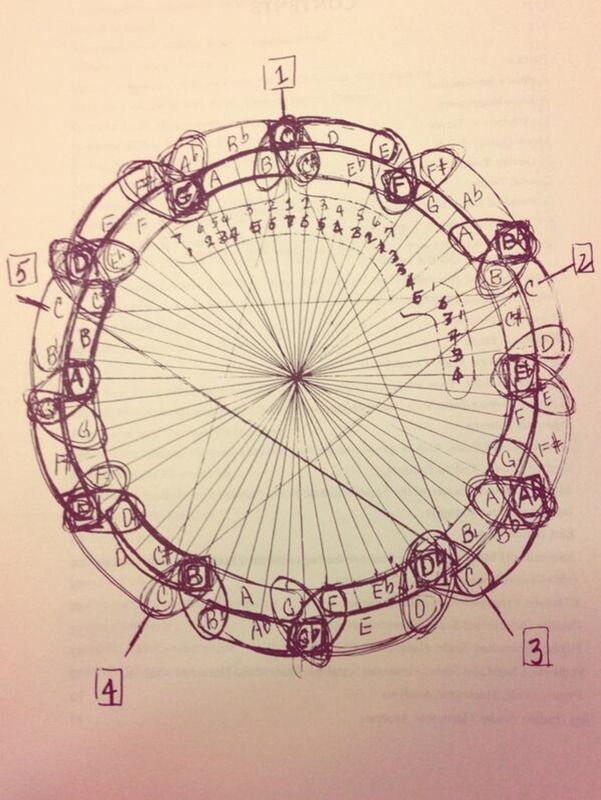 I'm wondering what Coltrane drew or wrote first—the literal order in which he laid out the diagram. My reasoning is that how he drew it will reveal more about why he drew it. Just looking at the way he's grouped certain pitches on the diagram it's easy to infer that Coltrane is displaying a form of chromatic modulation: indeed, this was pointed out to me. But the diagram isn't really needed to work out chromatic modulations—it doesn't explain why Coltrane didn't simply say to himself "when I see an F, I'll move to an E". So the diagram may have a theoretical basis beyond that. If you look carefully at the drawing, you'll notice that there are two concentric rings. 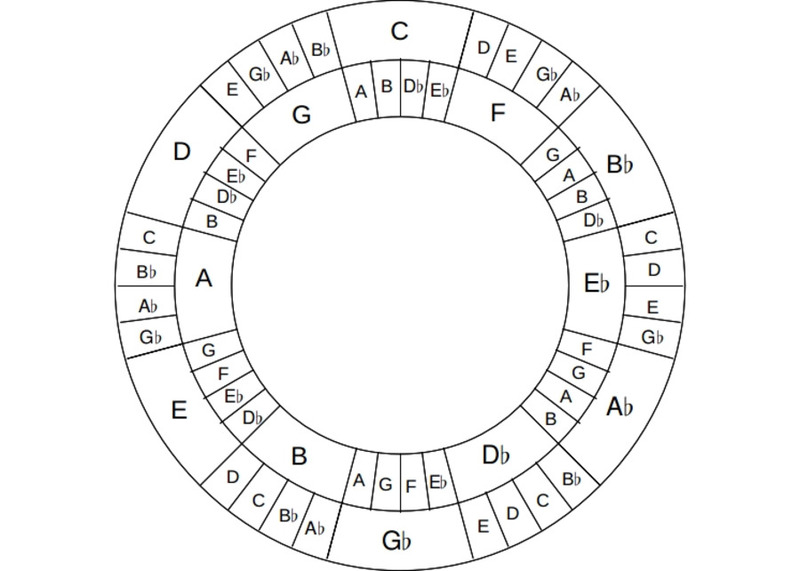 The outer ring has a whole tone scale starting from C; the inner one starting on B. 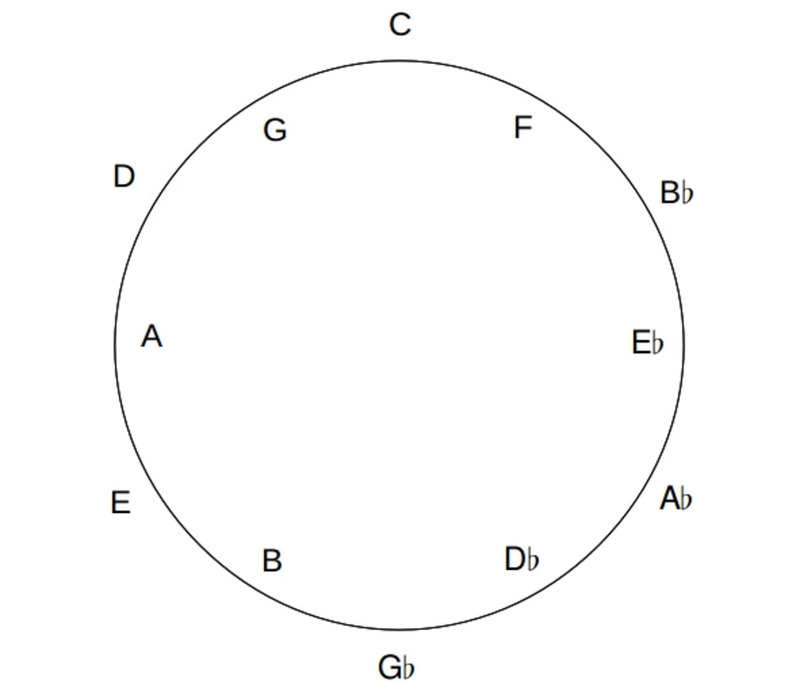 The arrangement of the rings is such that movement from one "main" pitch to the next results in the cycle of fourths. In the original, you can see that Coltrane put boxes around these "main" pitches. Coltrane also numbered where C appears on the diagram—there are five, and he connects them by drawing a star. What he did not do is draw a pentagon, which would also connect them. At almost every main pitch, Coltrane links it to the two neighbour pitches either side. 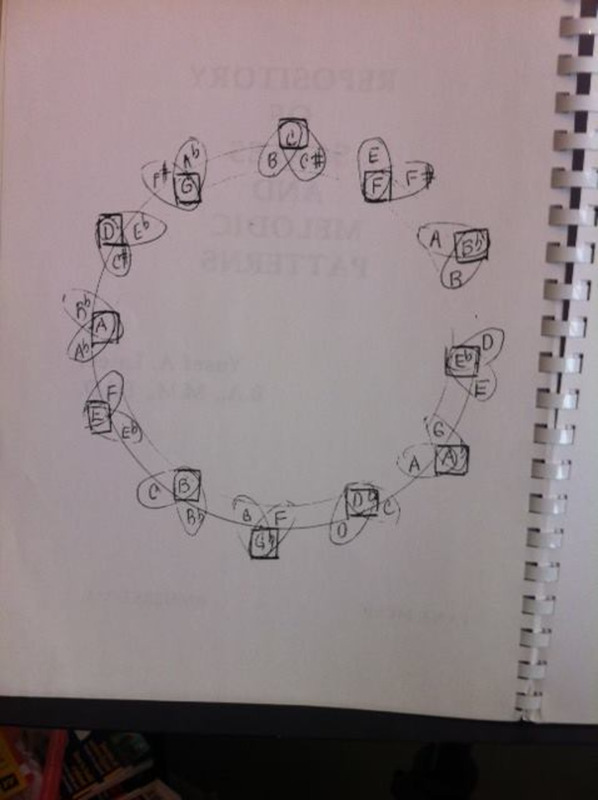 This is where we can infer a chromatic modulation. 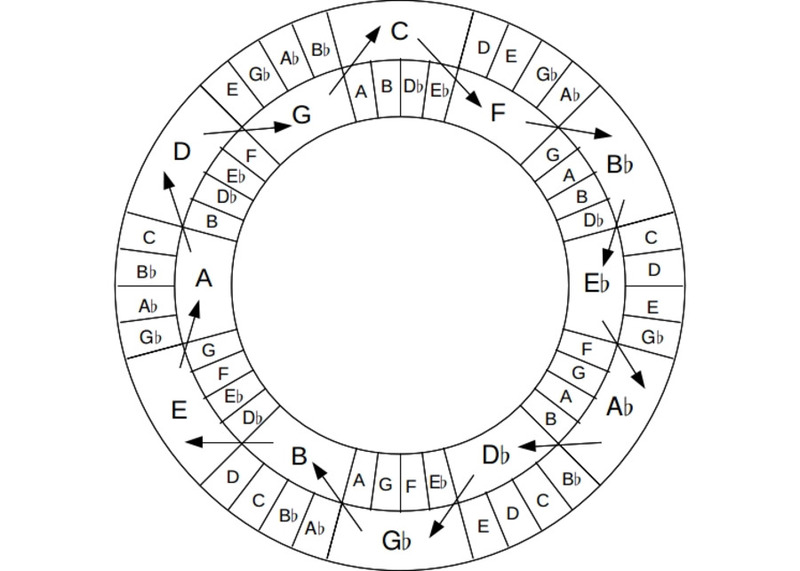 But if you look at the left-hand side of the picture at the main A pitch in the inner ring, you'll notice that Coltrane breaks this pattern, and instead links the G♯ [on my diagram the A♭] in the outer ring to the G and A in the inner ring. Is this a mistake? It's possible, but I believe he would have corrected it if he'd noticed. There are some number series written inside the chart; the upper part goes from 7 to 1 and then back up again while the lower part reverses this. In the later part of the sequence, Coltrane makes some form of mistake in the numbering, and corrects it by writing over the original numbers. Notice also that each "non-main" pitch is grouped with a neighbour: why? Aesthetics? Or a theoretical reason? So, to what I think was an order of events. I think a circle was drawn first; then the main pitches written as a cycle of fourths, with the position of each pitch being alternated between being inside or outside the circle. This would make the two whole tone scales. From there, the subsidiary pitches were written in to produce the repetition of each scale, and then Coltrane grouped them, for reasons that were entirely related to theory and go beyond a chromatic modulation. I suspect the numbers were written on last, perhaps just after the connecting spokes were drawn. Those numbers: they infer some form of relational series, but there are no other numbers on the chart other than the ones which mark off the Cs. What do they relate to? Perhaps they are scale degrees. I suspect Lateef's book might have the answers to this somewhere—might require a New Year's book hunt... but interested to hear from others who may shed some light on this fascinating diagram. I got quite a few responses to this on Facebook, and an e-mail from Robert Mitchell which I hope he'll make into a post. The handwriting looks very similar, and so I think they are both from the same hand. This corrected diagram makes the "how he drew it" a bit clearer for me: on the correction there are two guide circles; the "main" pitches are then written in as I described before. The pianist Matt Ratcliffe showed how you could derive Giant Steps from the beginning arrangement of pitches: "Most interesting in symbolic sense is the two equilateral triangles implied in the tunes constructed also known as the Star of David or the Seal of Solomon, very powerful symbolism especially in relationship to ancient knowledge and the Afrocentric and eventually cosmic consciousness direction in which Coltrane would ultimately lead on to with A Love Supreme etc..."
I definitely think Matt's right. But with Coltrane, we always have a maximal assumption problem. What we know about Coltrane's theories and how or when he applied them is not always based on what actually occurred, but with how we want to arrange the details. That the diagram has something to do with something is not in doubt: what it has to do with a particular song is unclear. 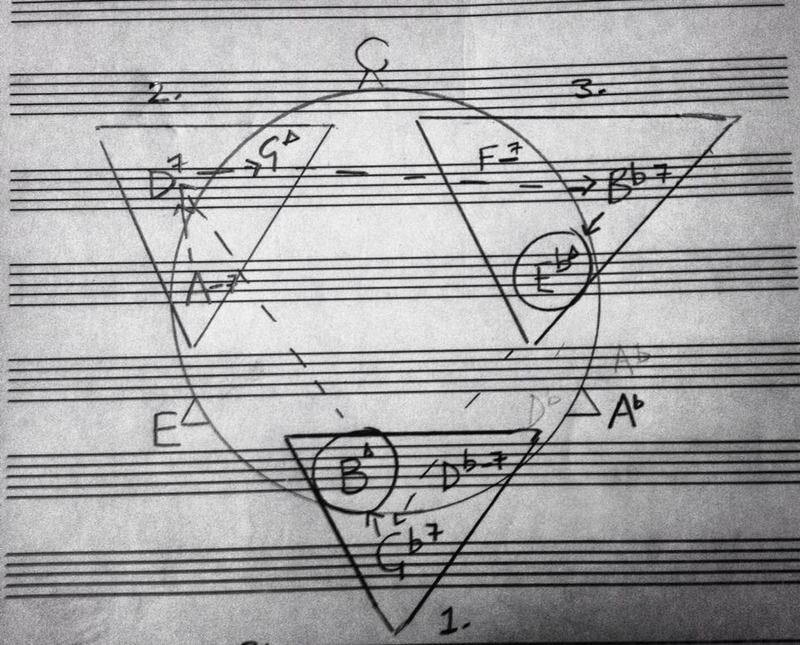 So I'm having to strip away my thoughts on how I want to arrange Coltrane's intention, and go on the diagram itself. I have written a second part to this article. Great analysis the Coltrane diagram. Thank you for the time you put into this. I've been going down quite the rabbit hole these past few years in regards to patterns in music, most notably, grid-based systems for composition and in the past year, how the Golden Ratio factors into composition. What I initially found most interesting about the Coltrane diagram was how patterns of seven emerge. 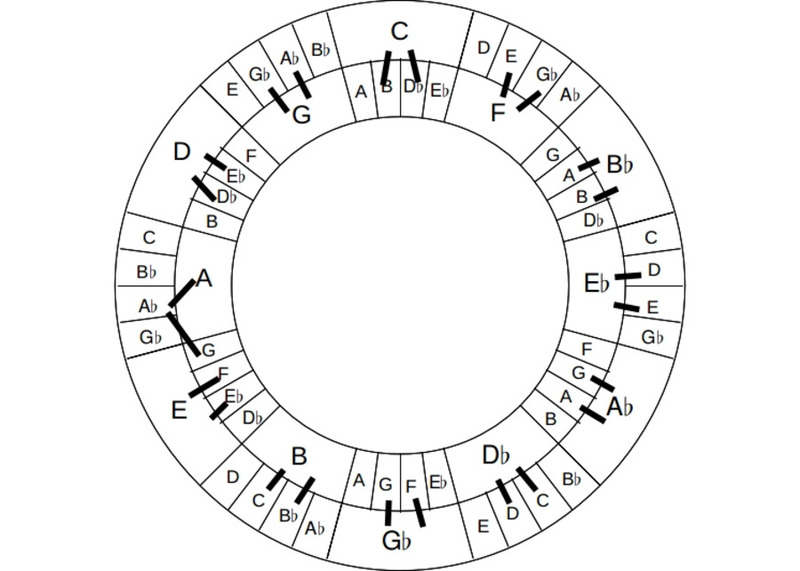 I interpreted the "V"-shaped ovals to illustrate how to traverse the inner and outer rings—start with C and work chromatically towards the F# (b5), a span of seven notes. Then, starting with F#, follow the same pattern and number of notes to the next instance of C (b5). The numbers 1–5 on the outside of the diagram note where each instance of the seven-note pattern emerges (and how many total, working clockwise from 12 o'clock. Perhaps his use of the cycle of fourths was an after-the-fact discovery (explaining why he made those notes bold)? The number seven appears throughout religious scripture. Who knows if this is a coincidence, or if Coltrane was trying to connect dots. I (presently) don't look at the diagram as a formalized composition tool, but rather a sketch of Coltrane seeking a deeper, spiritual truth in music.